I love free card offers and treat.com is offering one right now! Click HERE to create your own personalized getting card and enter the code 1NEWTREAT at check out. This offer is valid through September 2nd. If you need more cards, then also check out Cardstore.com's Labor Day Event! 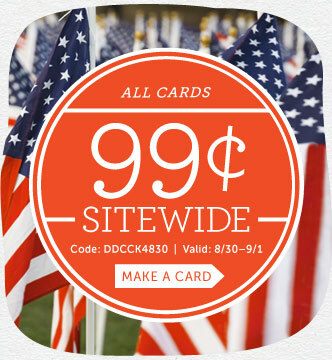 All Cards 99¢ Sitewide at Cardstore! Use Code: DDCCK4830, Valid 8/30 through 9/1/14. Shop Now!